Specifically designed to stimulate fast growth, Canna Boost Accelerator speeds up the developed of budding flowers to result in a more abundant crop. Canna Boost Accelerator is derived from naturally fermented plant extracts. Your fruits will mature at a more evenly distributed rate resulting in a crop that is sweeter and more pleasing to the eye. This highly acclaimed product is perfect for any environment and is able to be used with any combination of feeding system. It can also be used as a foliar spray so that the plant can fully absorb the accelerator though its’ leaves. 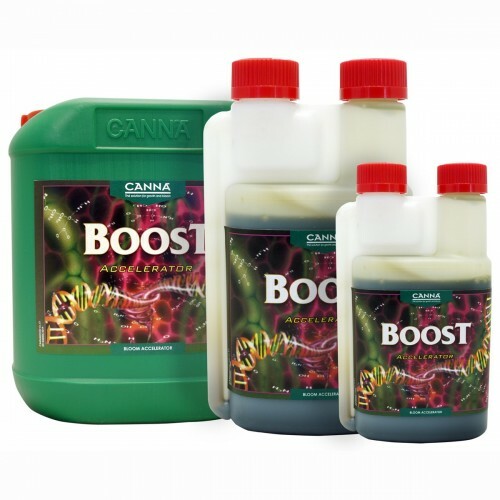 Used in conjunction with PK 13 14, Canna Boost Accelerator will help greatly increase the photosynthesis stage, ensuring that the fruit matures more rapidly. With the high level of nutrients in PK 13 14, adding Canna Boost Accelerator will yield a healthy and substantial harvest. This innovative product will help your plant mature beyond its full potential as well as have a stronger and more pleasant taste by further enhancing the natural flavor and sweetness of the fruit. Canna Boost Accelerator naturally boosts the natural energy that is already available in the plant and also gives it the strength to resist unhealthy pathogens. Therefore, it not only increases the flavor, but it helps prevent disease as well. Do not use the product in conjunction with any product containing H202 (hydrogen peroxide) as it will cause an adverse chemical reaction. Apply the product at the beginning of blooming stage, which usually occurs one to three weeks before the initiation of the flower buds. You can apply it as a foliar spray or by drip irrigation. Make sure to use the mixed solution within 7 days. Properly dispose of any unused product after that time according to the directions on the packaging. Follow the directions and measurements for your specific crop on the packaging closely for the best results.